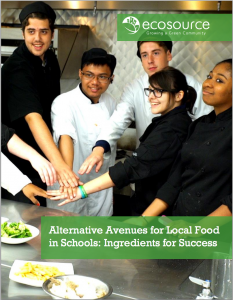 This report, Alternative Avenues to Local Food in Schools: Ingredients for Success, provides the current school food context in 3 regions, Durham, Peel, and Thunder Bay, details 7 pilot projects, and includes 8 “Ingredients for Success” or guidelines for implementing local food projects that resulted from the pilots. As you continue to bring local food and food literacy to students, we hope that this report is helpful for you. There are lots of inspiring local food projects and tips! Sign up and read the full report here. The Alternative Avenues for Local Food Procurement in Ontario Schools project seeks to address the need for assessment, analysis, training and barrier identification to increase the quantity of local foods procured in Ontario School Boards. Through Regional School Food Action Hubs across the province of Ontario, we are working to improve access to local food in schools, food literacy in school programming and public sector procurement of local foods in the community. This project aims to build stronger value-chain links in Regional communities between school food procurement practices and local suppliers through multi-stakeholder coalition action. Our work specifically addresses local food procurement through the contexts of student and teacher-led food programs (especially secondary school hospitality programming), student and school-led cafeteria programs, and student nutrition programs. The Alternative Avenues project is led by Ecosource in partnership with Roots to Harvest and in collaboration with students, teachers and school board representatives in Durham Region, Peel Region and Thunder Bay, with support from the Ontario Edible Education Network at Sustain Ontario. The Alternative Avenues project has been made possible with support provided by the Government of Ontario and the Friends of the Greenbelt Foundation.